I have reviewed the HCSB over the past 4+ years. I have anticipated the update to HCSB for the past year. Holman recently published online the update to the HCSB translation, now renamed as CSB (Christian Standard Bible). Printed versions are due out this month. I have not received a preview copy CSB17, so this comparison is based on the electronic version. 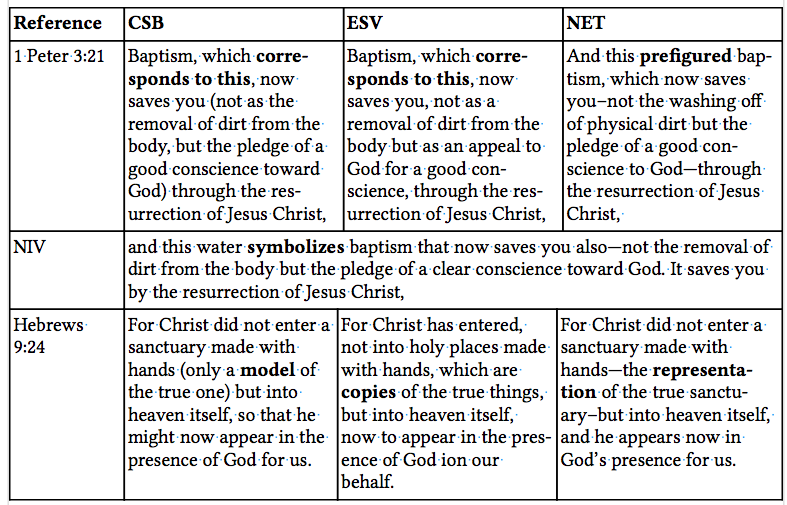 I am comparing CSB, ESV, and NET. The reason I used NET as it seems very close in purpose and translation style to CSB. This is a first step in evaluating Christian as a translation. I am looking at specific verses to see how it translates words/phrases. Further study will focus on readability and oral comprehension. The traditional (ESV/NAS/NKJV) translation of οὕτως as “so.” CSB and NET (and GW) translate the Greek word as “in this way” or “this is the way.” There is debate about which is the better way to translate. Note how each translation handles the same Greek word οὕτως, in John 21:1. ESV seems inconsistent in its translation. The ἵνα (hina) followed by the subjunctive is here equivalent to the infinitive of result, an “ecbatic” or consecutive use of ἵνα according to BDAG 477 s.v. 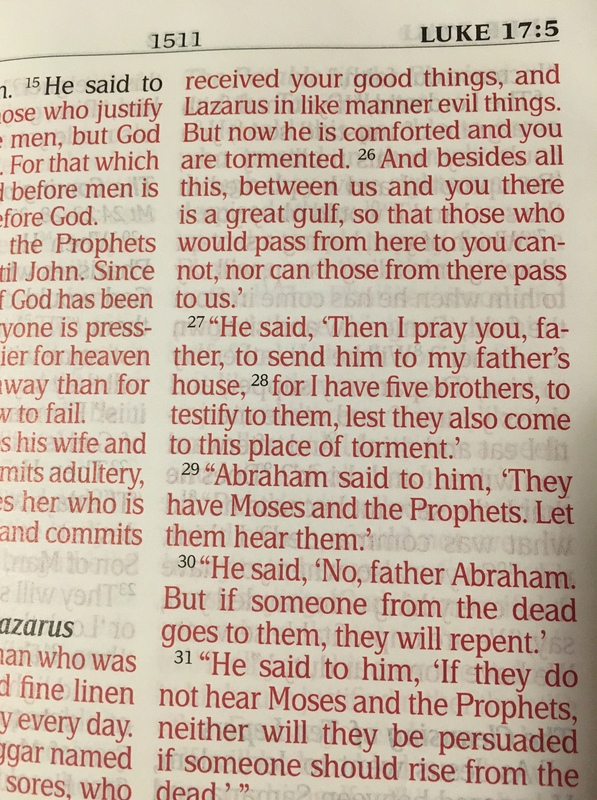 3 where 1 John 1:9 is listed as a specific example. The translation with participles (“forgiving, …cleansing”) conveys this idea of result. I think it better to use the infinitive form (“to forgive … to cleanse”) because it could be infinitive of result or infinitive of purpose. The use of participles can be confusing (attendant circumstances, etc.). The NIV confuses even more, because it is no longer clear whether there are two characteristics of God (faithful and just) or four (faithful and just and forgive and cleanse). The primary challenge here is how to translate (and interpret) the Greek word: ἀντίτυπος; the sense is that the first item (type) points to the second item, the greater thing (antitype). NKJV does not translate the word, but transliterates the Greek: ἀντίτυπον as “antitype.” Here NIV is the most confusing. People read “symbolizes” and interprets this to mean that baptism is a symbol of something. However, the symbolizing goes back behind that. And the greater thing is saving in baptism. Thus, it is not that baptism symbolizes , but rather actually does what it says, namely saves. Who heard and was troubled? I again have the privilege of teaching Matthew this quarter in our seminary. As part of my preparation I read four chapters a day, hence the entire book of Matthew every week. Each week I use a different translation. So this week (starting on Friday) I began reading in God’s Word (GW) Matt. 1-4. This suggests that “all Jerusalem” did not hear [the report] but was reacting to King Herod who heard and was troubled. When the king is troubled, then all Jerusalem is troubled with him. Thus, the threat of a king-challenger is of immediate concern to Herod. It is a troubled Herod that is of immediate concern for the people. NLT King Herod was deeply disturbed when he heard this, as was everyone in Jerusalem. Unfortunately the way the sentence is awkwardly constructed in NLT, the additional clause at the end is closely connected with “hearing” and not “deeply disturbed.” Yet the helping verb (“was”) suggests a relationship with “deep disturbed.” But who would stop and analyze that structure? The following translations catch the sense of the Greek sentence, that Herod heard the report, and that was troubling to him, and that then as troubling to all Jerusalem, contrary to GW (and NLT). NAS When Herod the king heard this, he was troubled, and all Jerusalem with him. NET When King Herod heard this he was alarmed, and all Jerusalem with him. NIV When King Herod heard this he was disturbed, and all Jerusalem with him. HCSB When King Herod heard this, he was deeply disturbed, and all Jerusalem with him. NAB When King Herod heard this, he was greatly troubled, and all Jerusalem with him. NJB When King Herod heard this he was perturbed, and so was the whole of Jerusalem. REB King Herod was greatly perturbed when he heard this, and so was the whole of Jerusalem. It seems that GW (and somewhat NLT) confuses the problem by making Herod and the people as the ones equally who heard and are troubled. Author exegete77Posted on 01/06/2017 Categories Greek, GW, Languages, Matthew, New Testament, TranslationsTags all Jerusalem, Epiphany, Herod, Matthew, Matthew 22 Comments on Who heard and was troubled? Daily reading today is Matthew 17-20. Here are some thoughts on MEV translation. MEV: Should you not also have had compassion on your fellow servant, even as I had pity on you? Note that same Greek word in a parallel construction is translated two different ways. NKJV does the same as MEV. NKJV: Should you not also have had compassion on your fellow servant, just as I had pity on you? NAS: Should you not also have had mercy on your fellow slave, in the same way that I had mercy on you? NET: Should you not have shown mercy to your fellow slave, just as I showed it to you? ESV: And should not you have had mercy on your fellow servant, as I had mercy on you? HCSB: Shouldn’t you also have had mercy on your fellow slave, as I had mercy on you? NIV: Shouldn’t you have had mercy on your fellow servant just as I had on you? GW: Shouldn’t you have treated the other servant as mercifully as I treated you? Every occurrence of ἐλεέω in MEV in Matthew is translated as “have mercy.” It is even more strange then, in this passage (18:33) that it be translated two different ways, and neither consistent with the way it was translated throughout the book. Since the intent of the entire pericope (Matthew 18:21-35) is the parallel response between the master and the unforgiving servant, it would make better sense to translate the word the same way in this context (“have mercy”) especially within the same sentence. This verse has been a sort of litmus test. How do we translate the future perfect passive participles? HCSB I assure you: Whatever you bind on earth is already bound in heaven, and whatever you loose on earth is already loosed in heaven. ESV Truly, I say to you, whatever you bind on earth shall be bound in heaven, and whatever you loose on earth shall be loosed in heaven. NIV Truly I tell you, whatever you bind on earth will be bound in heaven, and whatever you loose on earth will be loosed in heaven. NAS Truly I say to you, whatever you bind on earth shall have been bound in heaven whatever you loose on earth shall have been loosed in heaven. Looking at NAS (and ESV and NIV with footnotes) the the focus of authority resides with God and His prior action, not the person making the declaration. In essense, when the person declares “it is bound,” he or she can do so because “it will have already been bound in heaven (by God) prior to the declaration.” Likewise, when the person declares “it is loosed” he or she can do so because “it will have already been done in heaven (by God) prior to the declaration.” It is God’s prior authority and declaration that is being announced, not the individual’s own authority. The person announces God’s already determined response. This frees the person making the declaration from being the source of authority. And it let’s God Word be determinative. In my morning reading the text was Isaiah 6:1-7:9. I have read it many times. But today I read the text in the ESV. One verse stood out as awkward English. So I checked Isaiah 6:11 in other translations (none of ~30 translations I checked had what ESV has). I have studied the issue of English in translation in many contexts. I think that translations such as God’s Word offers a good example; the translation team had a full time (qualified) English advisor. The task of this advisor was to examine both written and oral choices and offering editing changes. Any of the above translations provide adequate good English style for this text. I would recommend that the ESV translation team revisit these three Isaiah texts to produce a more meaningful English rendition. Reading the daily lectionary, I have found some odd translation choices in terms of English usage in some different translations. The following readings come from today’s (Sep. 21) readings. With earlier readings from other days I noticed other odd or awkward phrasings. My goal is not to extensively deal with each text, but look at the English word choice and style used to translate the Hebrew. Lutheran Study Bible using the ESV has this alternative in a footnote: “mulled over in his mind what to do” (p. 745). NAS and ESV maintain the Hebrew sense, but in the process provide an awkward/unusual rendering in English to do so. Most of the other translations adapt the thought into common English usage. Note that ESV/NRSV/RSV-RCC use an odd way to express the Hebrew text. Most of the others show the reflexive (Niphal) sense, with “lost confidence.” NAB is unique in that the focus is not their own eyes that matter, but the eyes of the nations. Most translations offer a readable and understandable English rendering of the Hebrew. But notice ESV and RSV-RCC “God will give ear.” Aside from the original RSV and now lately ESV, I have never heard the use of “God will give ear.” My first humorous thought is “how many ears does God have.” With some practice, a reader might catch what is written. But what of an oral reading (i.e. in worship), will that communicate clearly and easily? This is not an academic exploration but a simple look at translation choices and how that fits the register of understandable (and primarily oral) English. Over the past several years as I have reviewed translations, I have found that ESV is problematic in this specific area. And it follows the RSV, NRSV, and RSV (RCC) pattern. This also makes me more aware of how I preach and teach and at what level (vocabulary, etc.) I do so. Hope to explore more on this topic.